In honor of the upcoming weekend, I wanted to highlight two little projects I completed about a month ago. They are super easy and need approximately 1 tool, a wrench. A trip to Home Depot had me looking for a new stopper. It was about $5, and I was on my way to pay when I noticed this. For $20, who wouldn't want a two way flusher? I believed them when they said it was easy to install. And get this, they were right! I needed the wrench to remove the old handle, but everything else just slid into place. The second DIY project I did was to replace the shower head. Our old one was pouring out water in copious amounts. I love a long shower, so something had to be done. I found a low flow shower head at Home Depot, but then on the way out I found a super low flow at 1-1.5 gallons a minute. 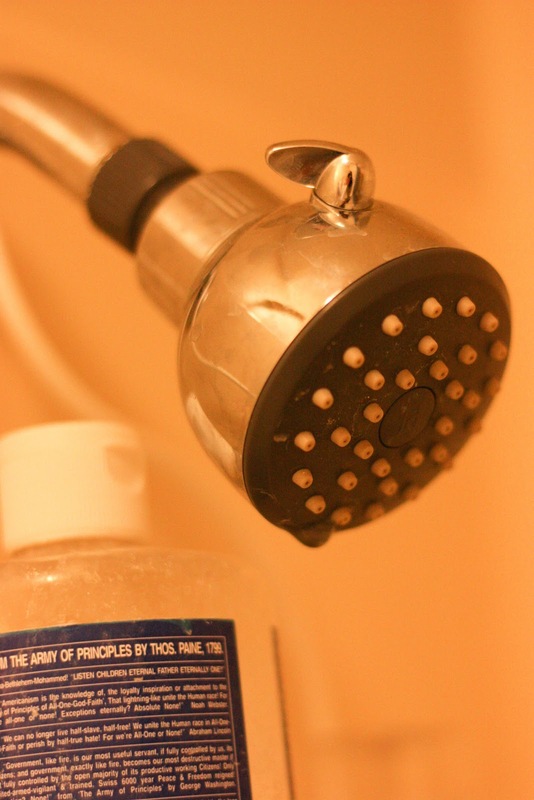 This shower head is for the long showerer and those who suffer green guilt. Most shower heads let 2.5 gallons out per minute and they are great water savers compared to the old shower heads. I needed a wrench to remove the old one and the new one screwed on just with my weak hands twisting it. Easy Peasy. Both of these projects are super easy no brainer water savers. They are relatively cheap, and as a renter, I can actually take them with me to wherever we go next. I kept the old parts for both the shower and the toilet. Now I can't wait to get the next water bill. I'm dying to see if we've cut down on our water consumption significantly. It will probably take awhile to make my money back on these improvements, but I think it's worth it. I love the flusher! I'm going to get me one of those. Does the shower head spray very hard? We've got a low flow head on right now, but the spray is too hard for my taste. 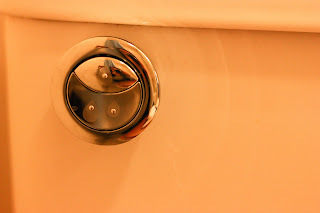 The flusher is awesome, especially since we have an old school toilet that flushes 5 gals each time (ouch!). The flusher works on the 1.6 gal new toilets as well. Which I think is way cool. The shower head we got does the best it can with 1 gal a minute, but the pressure is pretty low. Not a trickle, but it definitely won't blow you away. With all of us showering now, it's a good thing because I want the kids to get clean, but I'm not going to stay in the bathroom with them and coach them step by step on their shower to get them out quicker, y'know?